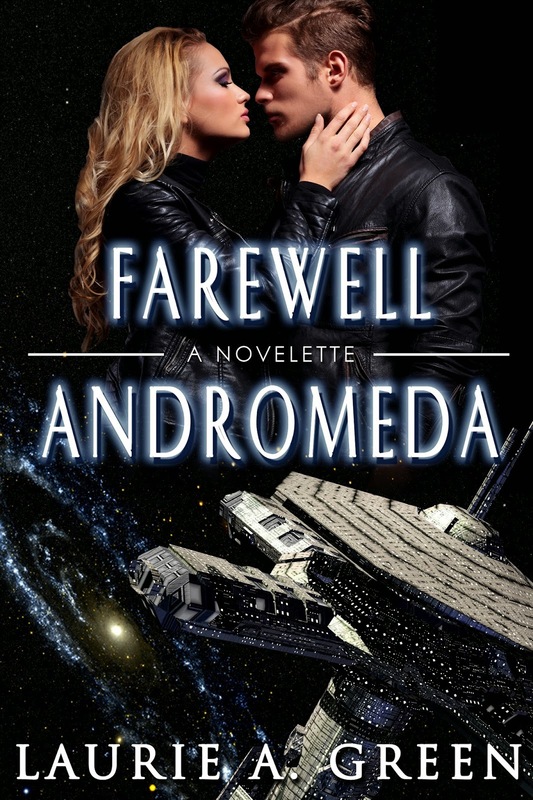 Congratulations to author Laurie A Green on her debut of Farewell Andromeda, a Kindle short read climbing the ranks already! Laurie chronicled the surprise early release on her blog Spacefreighters Lounge, but let me just add this novelette is a lead-in to Laurie’s award-winning epic novel which is coming soon. If you love science fiction romance, keep your eye on this gal. Or better yet, sign up for her newsletter! I’m sending off rockets for you, Laurie! It’s been a few weeks and I’ve forgotten to sign up with my usual snippet group, Science Fiction Romance Brigade Presents, but here’s a snippet from my SFR, Passages. Quinn, the hero, is at odds with himself over making the woman he’s fallen for his bodyguard. Yet, he needs her in this role. Good point. I had to get used to using the protection, which was saving our asses. She peered around the door. A moment later she ushered me into the sealed walkway. The long, dimly lit corridor curved, so we couldn’t see the end. I paced far enough back to duck at Eve’s signal, which did come. I hid, and even after I polished a port in either direction, the minutes dragged by. Footsteps marched down the walkway. A guard appeared. He passed through me, then disappeared. It killed me, but I waited to hear the door slam, then dashed for where I hoped my guard waited. She was there, at another set of double doors. My breath exploded out. “This guard wasn’t so willing to trade to out there.” She put her finger to the keypad, and it flashed green. She was so nonchalant—an act? I didn’t dare ask if she was okay. Glad you could join me. Looking for more science fiction romance? Go find the others on the Brigade website, or use hashtag #sfrbp. Thanks for reading! Thanks for stopping by to read my science fiction romance Passages, as part of the SFR Brigade Presents. Passages is a completed novel. The first two chapters are featured under ‘My Novels’ in the bar above and I’ve just updated a few recent changes. Here’s an excerpt from Chapter Two, in the heroine Eve’s POV, during a tense discussion with her electorg run-mate, Evard. Thanks for the read! The SFRB website will take you to more of our members’ contributions, or find us at #sfrbp. Thank you for visiting me through Science Fiction Romance Brigade’s Presents! I’m pleased to share a snippet from my SFR, Passages. Quinn, the hero, is also getting used to having—and placating—his bodyguard, an emotional woman only somewhat suited for the job. She crossed my arms and stared at me. Hope you’ve enjoyed their…negotiations. Read more SFR at the Brigade website, or head to twitter with #sfrbp. Thanks for reading! Thank you for stopping by to check out my snippet from Passages, my science fiction romance…which may need a genre label shift. SF also stands for ‘speculative fiction,’ right? Seems my novel might fall into the ‘science fantasy’ genre. Still looking into it. Anyhow, here we go: Quinn has never experienced small town life before, and now that he’s in hiding, it’s all he’s got. Eve rolled her eyes. “Mylta, what’s the news this morning?” She raised the cup to her lips again. “Winds gusting at a steady thirty with the moons tracking each other, so DeLentes should be within the day. The first kidding occurred last night at my brother’s, twin whites. They’re pleased,” she said with a grin. Mylta left and Eve shrugged in answer to my raised brow. “You were never here.” She took a long draught of coffee. “Care to place a bet on that?” He plopped into his chair, ripped a muffin in half and dunked one side into his coffee. Eating it, he eyed Eve. She studied him, the coffee finally forgotten as she chewed her lip. This explanation was going to be good. We’ve got more SFR at #sfrpb or the website. Thanks for reading! Another week, another bit of Passages, my science fiction romance. When Quinn finally finds his missing ‘brother’, he discovers those memories of their fights weren’t exaggerated. Eve is afraid she might have to put her bodyguard function to use. The tenor of the room changed with that one remark and Quil’s reddening checks. I edged out of my seat. Evangeline gave my hand a squeeze before letting go. I moved up beside Evard, shutting my gift away to avoid a repeat swamping by Quil’s intense anger. Quil threw up his arms. “I assumed the guards were breaking off crystals or pick-axing them out of the rock. Isn’t that what goes on in underground mining? And after I’ve run three megabytes of hornwort data through not one but four versions of analysis to give us the best possible comparisons on the six most rapidly changing lab results, I hear the worst lab hasn’t been functional for weeks. More likely, it’s been down the entire two and a half months we’ve been here. And all you spare time for is her rather than your duties when you dashed through.” His flashing eyes flicked to me for a second before returning to Quinn. Want to read more science fiction romance? Find us at #sfrpb or the website. I’m guilty of a gap in postings. *sigh* But I’m back again with another excerpt of my science fiction romance. My hero Quinn discovers his new bodyguard Eve is not a happy camper when he disappears before she’s had her coffee. I’d gone to the sideboard to pour a second cup when the door swung open and slammed the wall. Helmet in hand, Eve strode in, fury boiling from every inch of her tall black figure. “You left without notifying me,” she snapped. Her armor was fully hardened, accenting every curve. I lowered my cup to the counter, keeping my eyes on her face. It was a struggle. Between that and coming up with a response that was both authoritative and not off-putting, I didn’t have a chance. Thanks for the visit! Please check out my fellow posters on the SFR Brigade at the blog, or our hashtag #sfrpb.